Rules, laws, policies, etc. are set in place so that people can adhere to them to achieve a high-quality life, be it in a personal or professional setting. That’s why when you do bad or wrong things you will have to face the consequences for your actions. However, you cannot automatically be persecuted without proper warning or notice. 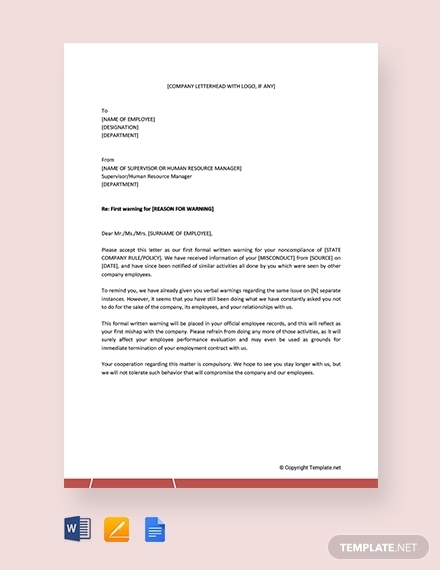 In this sense, a warning letter is used to inform those concern or affected about a rule, law or policy they have violated, and the consequences they will have to face. It ensures that they have an idea of what they did wrong and that they will be subject to questioning and sanction/s. 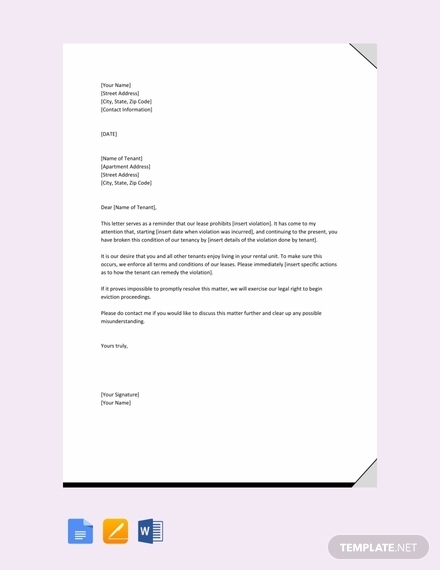 Letterhead: The letterhead provides information about the sender or writer of the warning letter. 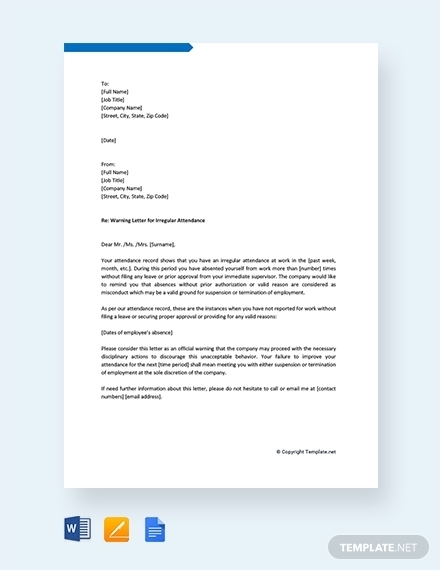 It is important to provide this element in the letter to inform the recipient who it is from; therefore, giving an idea of what the contents may be about. It should contain the name of the sender, address, and contact information, such as phone number and email address. 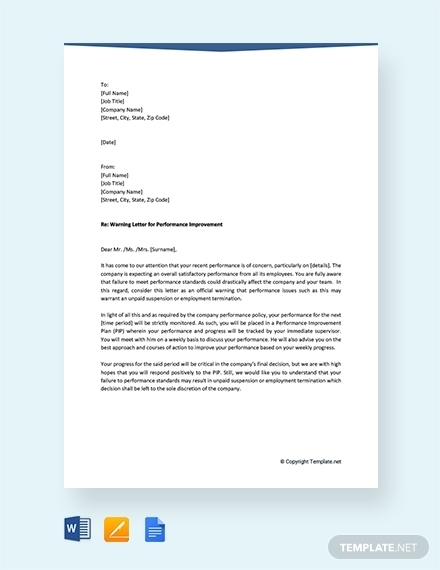 A business or company logo may also be included in the letterhead. 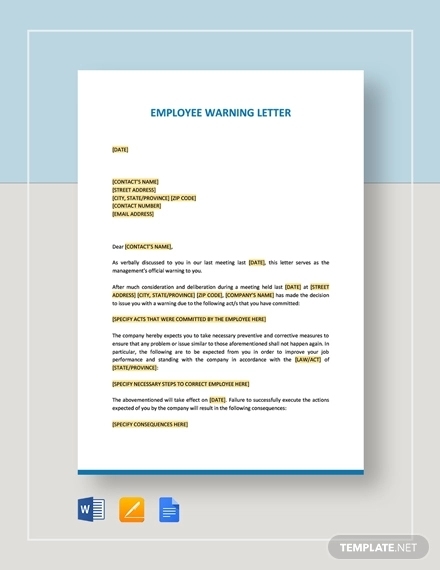 Name of recipient: The warning letter should be directly addressed to the erring recipient. This ensures that the letter will make it to the right person since its contents are and should be confidential. 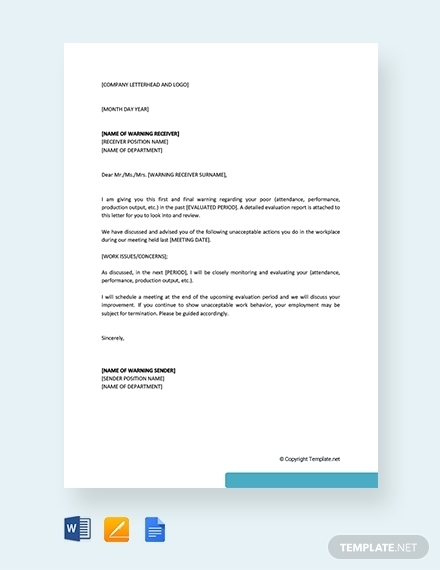 Therefore, the name of the recipient should be indicated below the letterhead to make it more visible; the full name of the recipient should be written with the proper title e.g. Mr., Mrs., Miss, etc. 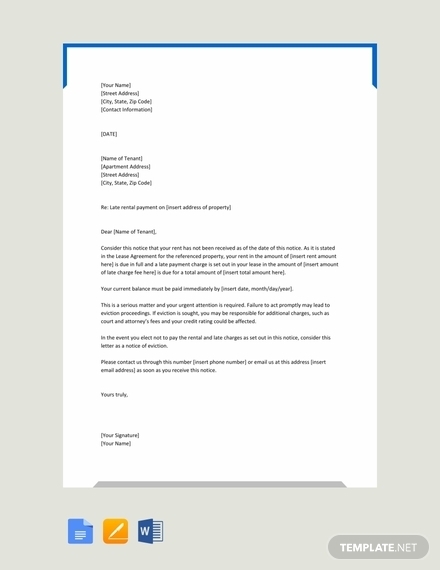 Date: Since this letter is crucial and urgent, it needs to be sent immediately after it is written and approved. The date should indicate when the letter was written and sent out. It could be in an American English month-day-year (February 1, 2019) format or British English day-month-year (1 February 2019) format. 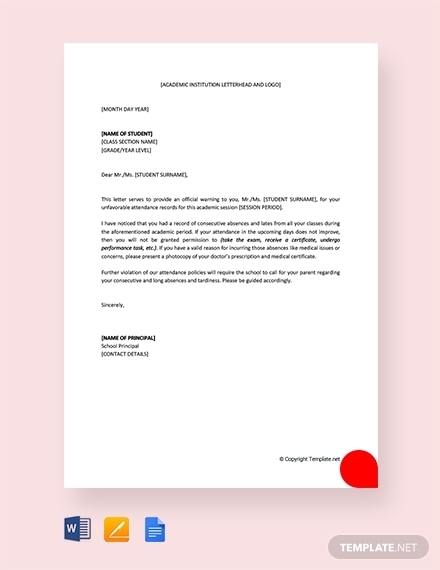 Subject: The subject of a warning letter should immediately express or explain the main topic discussed in the letter. For example, a late payment warning letter should have the subject Late Payment Warning or Warning for Late Payment. Only use a few words that describe or relate to the main topic or idea of the letter. Nature of violation: The nature of the violation that the recipient has committed should be clearly indicated in the body of the letter. For example, if a renter has violated the rule or policy of not allowing pets within the premises, it should be specified in the letter along with the clause where it was stated in the rental agreement. 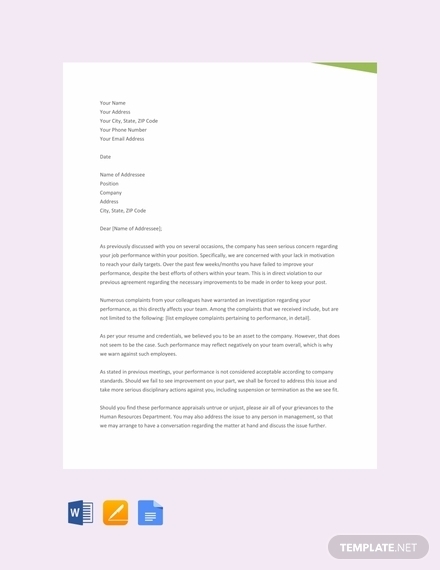 Supporting details: Since this letter is professional and official, it is important to provide supporting details to the claims that the recipient has violated specific rules or policies. The date, time, location, scenario, etc. that the violation was committed should be provided after the nature of the violation. Remedies: Aside from the nature of the violation committed by the recipient, remedies or sanctions that he or she must face should also be included in the letter. Remedies make sure that the recipient does not repeat the mistakes or violations he or she has committed. Authorized signature: A warning letter is official; therefore, it must have the siganture of the authorized party affixed below its contents. A signature line must be provided on the bottom part of the page, and should indicate the name and position or role of the signer. 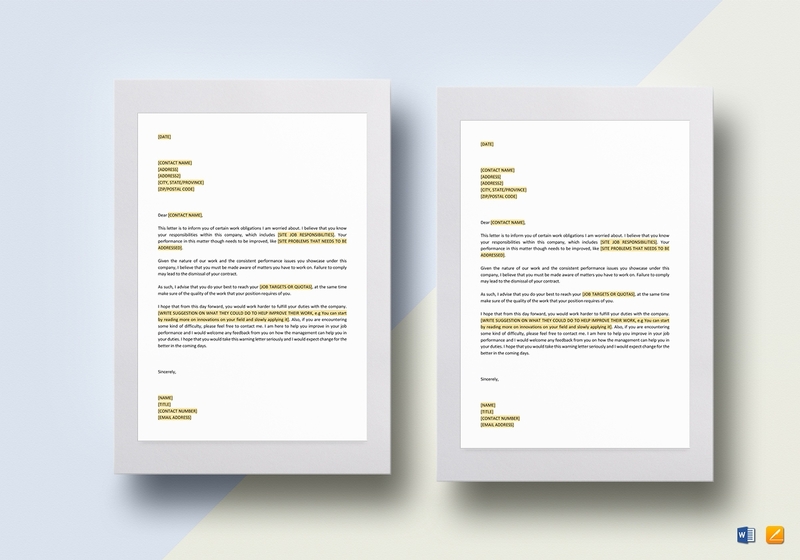 You can also check 20+ Termination Letters Examples and Templates. 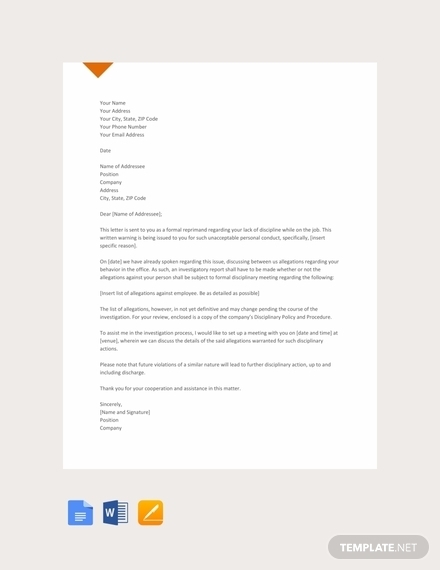 Indicate letterhead: The letterhead of your letter should be indicate on the top most part of the page. It is best to use a bigger and bolder font style and size for the name of the sender. 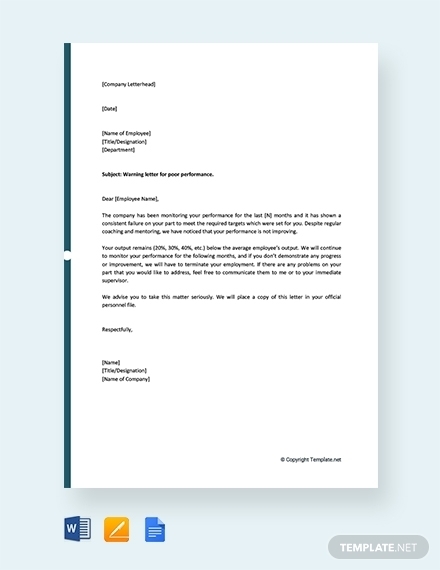 You can also arrange the contents in an inverted triangle format; just make sure is aligned and centered on the pageyour letterhead. Write recipient information: This is basically the inside address of the letter. Make sure that you provide the correct full name of the recipient along with his or her address and contact information. 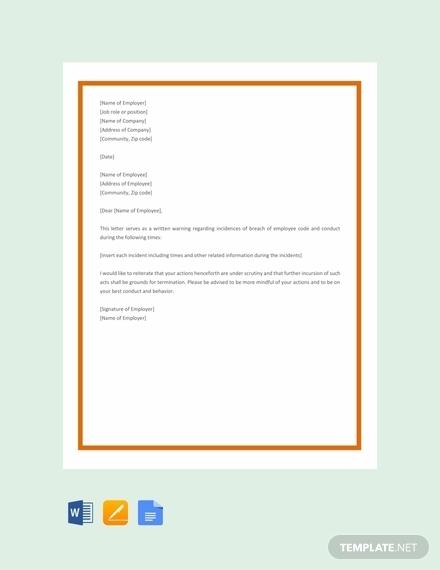 Since this is still a formal letter, it is best to follow a standard letter format where the inside address is indicated on the left side of the page. Provide accurate date: The date of the letter should be written two spaces below the inside address. Remember to provide an accurate date when the letter was written and sent. 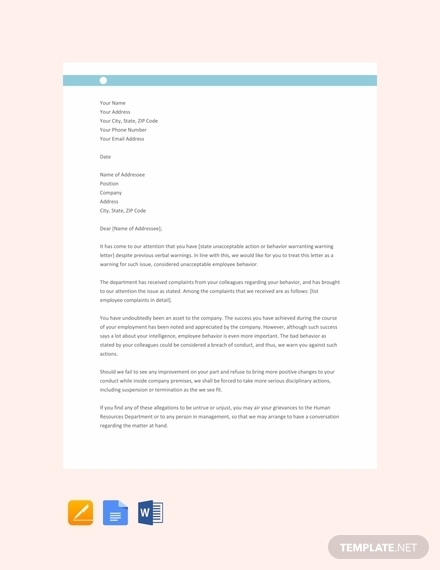 Write a clear subject: Similar to how the contents of a topic outline are written, you should also write a few keywords as the subject of the letter. 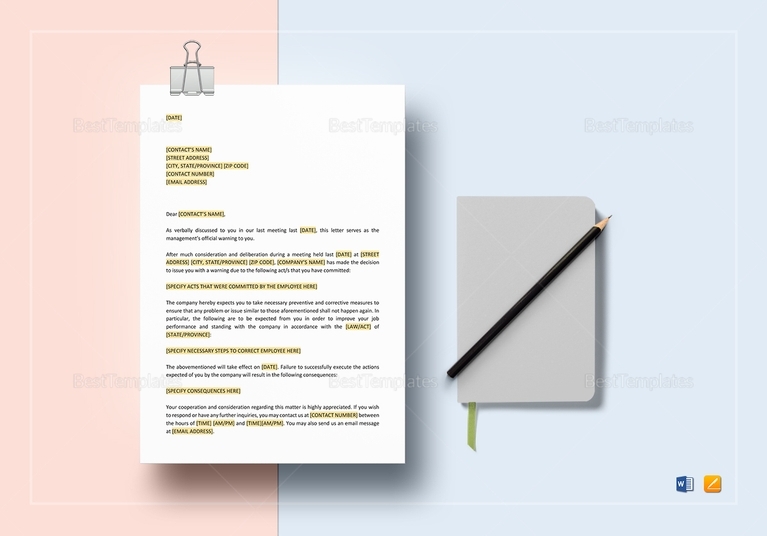 The subject should provide the recipient a clear idea or overview of what is being discussed in the letter. Present facts and information: Facts and information that describe or relate to the main topic discussed in the letter should be provided. This means you need to state the specific violation that the recipient has committed along with supporting details, such as when, where and how the violation took place. You should also specify the clause in the agreement or contract that define why it was as a violation. 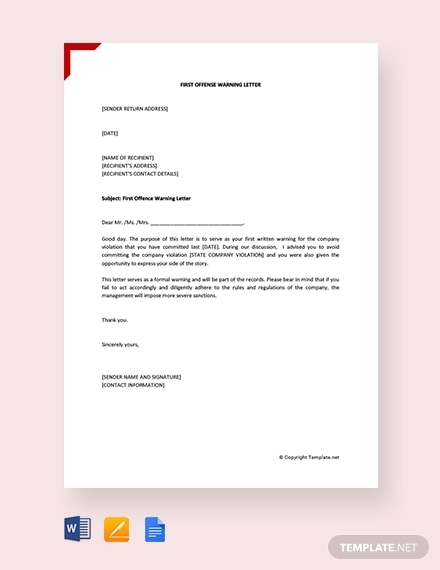 Provide a signature line: Since the topic discussed in the letter if of official business, it is best to have an authorized body to affix his or her signature in the letter. Therefore, you need to provide a signature line after you formally close the letter. The name and position or role of the signer should be indicated, and a line indicating where the signature should be affixed should also be included. Proofread and edit accordingly: Before the letter is signed and delivered it needs to be proofread and edited accordingly. Make sure that there are no errors and mistakes; even minor mistakes such as misspellings, wrong punctations, etc. should be avoided. Read about 10 Warning Notice Examples & Samples. 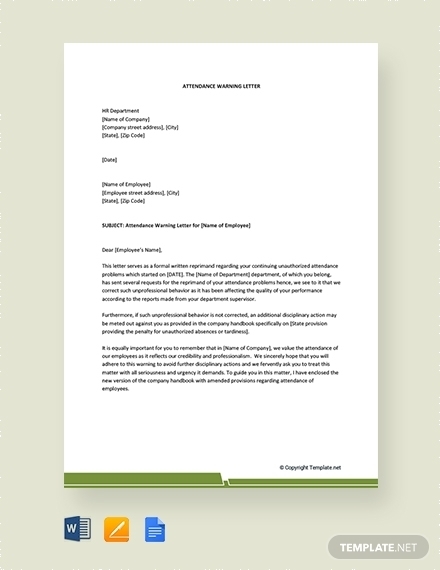 Attendance Warning Letter: This is given to employee/s who has chronic tardiness and absenteeism issues. 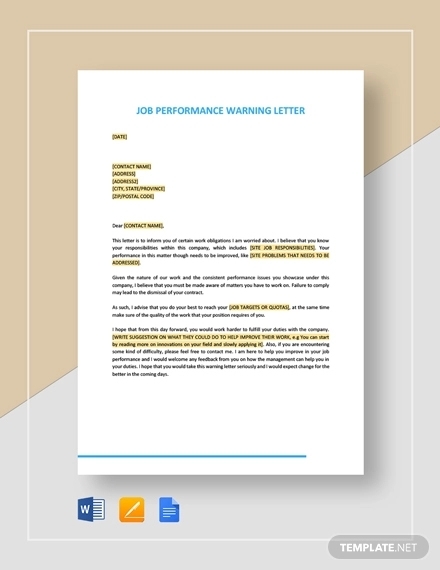 Performance Warning Letter: When an employee is underperforming in reaching the quota, this type of warning letter is written and sent to him or her. 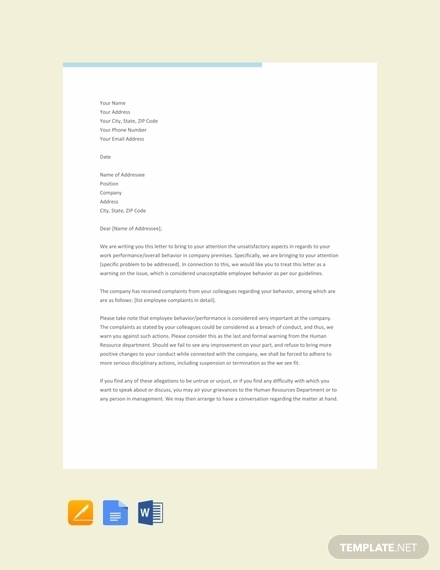 You may also see 9+ Disciplinary Action Form Examples – PDF, Word. 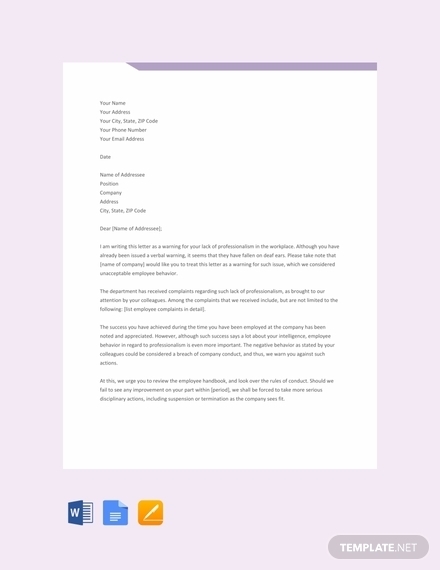 Behavior Warning Letter: This warning letter is written to an employee who has exhibited unethical and unacceptable behavior in the workplace. 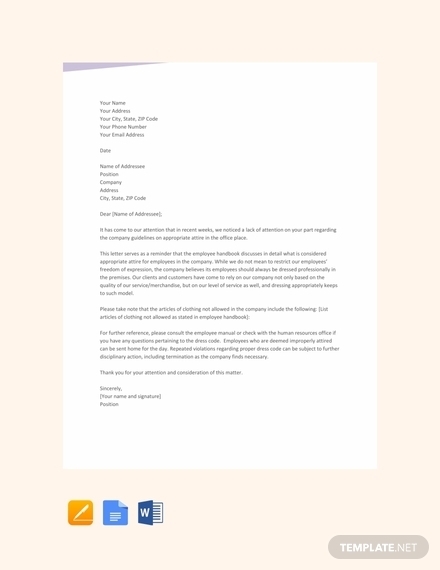 Construction Safety Warning Letter: When a construction firm or anyone constructing establishments is not able to adhere to laws and policies outlining the safety precautions in the workplace they are often given a construction safety warning letter. 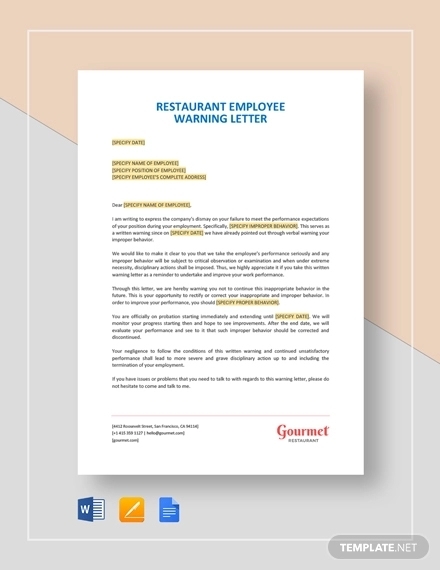 Food Safety Warning Letter: Office and agencies, such as the Food and Drugs Administration (FDA) set forth policies that food manufacturers have to adhere to ensure the safety of the products that they produce. 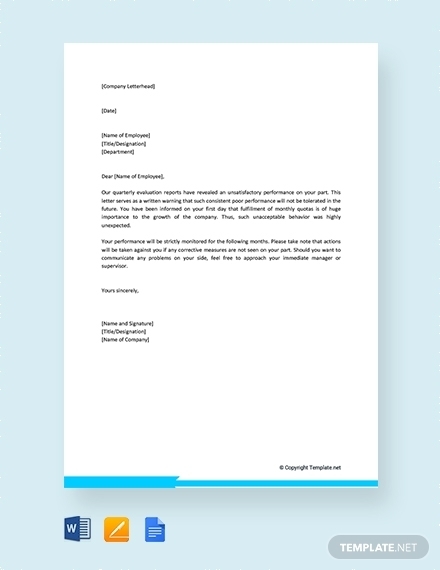 Should the company fail to comply, they are given a warning letter. Safety Violation Warning Letter: Specific government offices and agencies have rules and regulations that need to be followed to ensure the safety of the people. Should establishments or even homeowners fail to do so, they are warned and encouraged to comply.